McKinsey and Co's 7S model provides a useful framework for assessing internal strategic alignment and analysing the strengths and weaknesses of an organisation (see also 9 Essential Strategy Analysis Tools). The McKinsey Consulting Firm identified strategy as only one of seven elements exhibited by the best-managed companies. The 7Ses can be divided into two categories: Strategy, Structure and Systems can be considered the "hardware" of success whilst Style, Staff, Skills and Shared values can be seen as the "software". Companies, in which these elements are present and aligned are usually more successful at the implementation of strategy. Strategy is about the degree of alignment around the vision and direction of the company, as well as the manner in which it derives, articulates, communicates and implements that vision and direction. Does the firm have a clear strategy? Is there a clear, logical and understood connection between and understanding of the firm's strengths and weaknesses, environmental context, strategic intent, strategic and business plans, and management information and control systems? Is the strategy known to and understood by the staff in the organisation? Is it communicated to everyone as appropriate in a way that accords it the right amount of attention? Is everyone aligned behind the strategy? Do key individuals continue to pursue their own strategies and agendas, contrary to the strategy? Is the organisation opportunistic or is it inclined to develop detailed plans and stick to them? Is strategy formulated by an elite group (strategic planning group or senior executives) and handed down from the top, or using an inclusive, participative bottom-up process? Is the strategy transformative (large and structural changes to the firm or industry) or incremental (smaller adjustments)? Is the strategy reviewed and cast in stone once a year, or more regularly (or even continuously)? 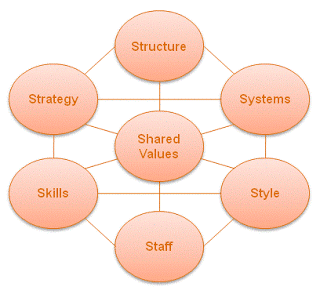 What is the organisation's strategic style? See also: The 5 Levels of Strategic Orientation. Structure includes both staff reporting lines, as well as committee and other governance structures and other governance structures. Structure considers the depth and breadth of structures, levels of collaboration, centralisation and decentralisation. It is a truism of strategy that "structure follows strategy", and the structure of an organisation, along with its policies and processes, has a direct bearing on how well it will perform. There are a number of dimensions to consider. Is it flat and broad or deep and hierarchical? How many layers are there between the CEO and the front line? What are the typical spans of control for managers? Is it organised around brand, products, channels, customer segments, geographic or functional lines? How well does the organisation's structure map onto its value chain? Is decision-making authority devolved or highly centralised? Are there clear lines of accountability? Do key elements of its strategy span or fall between multiple decisions makers at the senior level, or are accountabilities clearly established? Consider also Porter's categorisation of group structures, distinguishing between those which are efficient allocators of capital, those which are efficient allocators of resources and skills, and those which are structured around the sharing of capabilities. Systems include both computer systems, manually systems and informal practices. They cover all processes in the Value Chain, including both core (operational) and supporting (HR, Finance, etc.) processes. The decision-making systems within the organisation can range from management intuition to manual policies and procedures, to structured computer systems, to complex expert systems and artificial intelligence. The level of rigour of systems can range from rigid and bureaucratic, to more laissez-faire and flexible. Are the systems modern and efficient or out of date? Are they fit for purposes? To what extent are systems formally controlled by a central IT department or reliant on end-user-computing? Are systems bespoke or off-the-shelf? If bespoke is the development in-house or outsourced. If off-the-shelf, how heavily are the systems customised? What are the licensing and support arrangements? How flexible are the systems/development capability? Can they easily adapt to changes in the environment and strategy? What is the quality, in terms of errors, exceptions and downtime, etc? Are adequate Disaster Recover Plans ("DRP") in place? Style refers to the employees' shared and common way of thinking and behaving - unwritten norms of behaviour and thought. Are people generally relaxed and informal, or more formal? Is the culture collegiate and consensus driven, or more hierarchical and individualistic? Are leaders authoritative, or persuasive? Do they lead by example, or by fiat? Are leaders visible and available or remote? Is there a culture of busy-work, or is it more results based? How does the organisation reward and celebrate success? How politically charged is the environment? Do staff respect or fear their colleagues and leaders? Is the culture one of leadership and transformation, or managerial and weighted towards the status quo? Are people open to change and transformation, or do they prefer to stick to "the way it has always been done"? Staff means that the company has hired able people, trained them well and assigned them to the right jobs. Selection, training, reward and recognition, retention, motivation and assignment to appropriate work are all key issues. Is the selection, training and reward of staff all aligned to the strategy? Are job responsibilities clear (up-to-date) and aligned to the strategy? How are different people matched to different roles? How does the organisation manage under-performance? How does the organisation identify and treat high performers? How is training done: externally, internally; in classrooms or on-the-job? How are role modelling and mentoring used? What is the ratio of fixed to variable pay? What is the degree of variation in variable pay between high and low performers? Levels of skill and knowledge required can range from the PhD level qualifications required for highly technical or scientific work to relatively unskilled labour such as supermarket shelf stacking. The levels of skills required by different functions within the same business may vary significantly. Are staff skilled in their work, in general, and/or relative to the competition? Does the organisation promote specialisation and focus, or generalisation and rotation? Does the firm nurture skills internally, or hire them in? Does the firm have ready access to a market of skilled resources? How do staff stay up-to-date with developments in their fields? Is existing of skills or the investment in growing or acquiring skills aligned with the firm's strategic priorities? What is the mix of skilled versus unskilled (or less skilled) work and staff? Are the skills and knowledge required generic to the industry or field, or specific to the firm? Values are things that you would strive for even if they were not demonstrably profitable - things that are worth doing in and of themselves. Shared values mean that the employees share the same guiding values. Values act as an organisation's conscience, providing guidance in times of crisis. Does the organisation have clearly articulated values? Are those values a laundry list of the usual keywords ("Integrity", "Teamwork", "Putting the Customer First") or has the organisation imbued them with real and personal meaning? To what extent do all staff and leadership align with and practice the values? Is it evident that the values influence decisions on a day to day basis? Does the organisation value "hard heads" (rational thinking, value maximisation, etc.) or "soft hearts" (social good, etc.). Identifying corporate values is also the first essential step in defining the organisation's role in the larger community in which it functions. You can build a McKinsey 7S analysis, alone or with a team, using our completely new and free collaborative StratNavApp.com.